March 25 marks the passing of Friedrich Ferdinand Runge. Runge was a German chemist most famous for discovering caffeine. As a young man, Grunge gained a name for himself for discovering the effects of belladonna extracts on pupil dilation. Belladonna or deadly nightshade relaxes muscles and when applied to the eye, the pupils dilate. Grunge was known for dramatically demonstrating this on cats. One of his demonstrations had a famous celebrity in the crowd. Johann Wolfgang von Goethe was a famous poet and the author of Faust. He also had a great interest in botany and felt Grunge’s work with plants was interesting. Goethe even visited the laboratory where Runge was working on his plant extracts. The two men struck up a friendship Goethe entrusted some expensive Arabian mocha beans to Runge to investigate their properties. Goethe told him people who ingested the beans felt awake, focused, and happy. Runge eventually isolated some bitter white crystals from the beans he called koffein as was the active compound in the beans. Grunge moved onto other avenues of chemistry including purine chemistry, the invention of the first blue aniline dye which he made from coal tar, and the development of the analytical technique known as paper chromatography. Even though his star was rising in the chemistry world, he had a falling out with his employer which cost him his job. Runge never really recovered from this and died in poverty and relative obscurity. 2000 – Ruth Erica (Leroi) Benesch died. Benesch was a French biochemist who, together with her husband, Reinhold, discovered the method hemoglobin transports oxygen during respiration. They discovered that hemoglobin recognizes the build up carbon dioxide as cells metabolize sugars as a cell that needs the oxygen it carries. They found a compound called 2,3-bisphosphoglyceric acid is used to weaken the bond in hemoglobin holding oxygen. 1951 – 21-cm hydrogen line first detected. 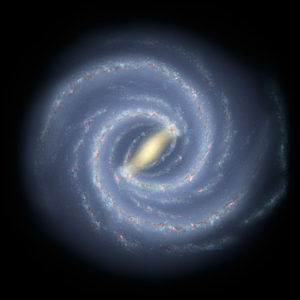 Artist’s impression showing the shape of the Milky Way galaxy from currently known data. Harvard University astronomers Edward Purcell and Harold Ewen first detected the theoretical 21-cm radio spectral line of hydrogen from the Milky Way galaxy. This spectral line was predicted to be produced by transitions between the hyperfine structures of the ground state of hydrogen. Since hydrogen is the most abundant element in space, photons with this energy should be able to be detected easily. By measuring the intensity and redshift of this line, a star’s position and velocity vector could be accurately measured. Maps made from this data confirmed the spiral structure of the Milky Way galaxy. 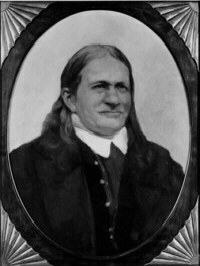 1867 – Friedrich Ferdinand Runge died. 1655 – Saturn’s moon Titan discovered. Saturn’s largest moon was first observed by Dutch astronomer Christiaan Huygens. 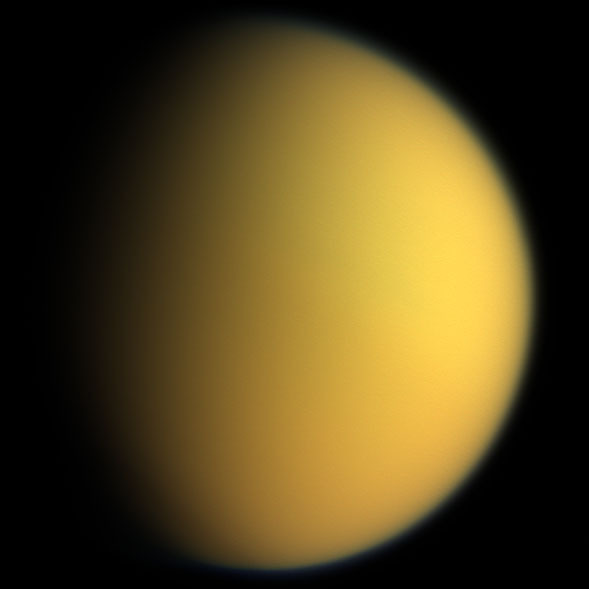 Titan is 1.5 times as large as Earth’s moon or about the same size as the planet Mercury. It also has its own atmosphere of mostly nitrogen (97%) and methane (2.7%). He called his discovery by the uninspired name of Saturni Luna or “Saturn’s Moon”. When Giovanni Domenico Cassini discovered four more of Saturn’s moons from 1673 to 1686, the name became Saturn II and Saturn IV as the newer moons were discovered. This naming convention continued until it had the name Saturn VI and John Herschel started naming the moons after the Titans. ← Do Daffodils Poison Other Flowers?